In the unrelenting summer heat of the Colonies, tempers begin to fray as those with allegiance to Iweko Seiken and Iweko Shibatsu take an increasingly militant stance against those who disagree with their philosophies. While the heirs themselves do not advocate military conflict against the forces of their brother, their followers lack the same sense of discretion and self-control. As temperatures soar, self-restraint begins to fail, and blood will be spilled in the name of Imperial succession. Heavily tied with the events unfolding at the tournaments held at GenCon. Furthers player options for both draft and constructed play with 156 new cards legal in the Ivory Arc. Fantastic art from the likes of Steve Argyle, Immar Palomera and Sergio Camarena, lending weight to the conflict developing in the Empire. 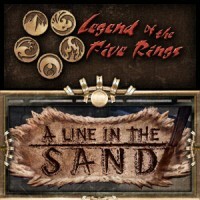 Add a Review for "Legend of the Five Rings – A Line in the Sand"